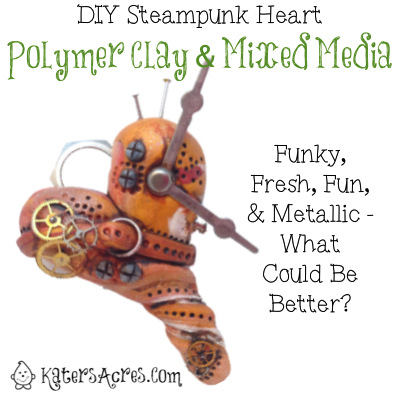 This is a great introductory project for Christi’s awesome “Steampunkery” book. If you do not have this book yet, I am giving a copy away direct from Christi Friesen! There’s only 2 days left, be sure to enter to win it now. Now let’s get started with our polymer clay heart mini-tutorial! This tutorial is in Christi’s “Steampunkery” book and begins on page 7. In order to do this tutorial, you will need to make a heart. Here’s a sample of how to make a heart from polymer clay. While the heart you see at the left is not the heart you will see later, it is a perfect demonstration of how to make it a quick, simple, and easy way. I make most of my hearts this way as it’s the easiest for me to do. This heart tutorial is adapted from the tutorial on PCPolyzine. First start with a ball of clay (I used scrap clay from leftover leaf parts). Then you can shape or reshape your heart as you would like. Give it a pointy end, make it swirl, the decision is yours! After you’ve made your heart as shown above. It’s time to add the “punkishness” that your heart desires! Start with the end. You can curl the end or twist the end or smoosh it … whatever you’d like! It’s your heart! Then take all your steampunk gadget, gizmos, cogs, and gears and add them to your heart in any kind of a way you’d like. Note: You can also used preformed watch parts, brads, small screws, hex nuts, and more! Scour your local department store for the smallest parts you can muster! Don’t forget to add screws, belts, and oodles of dots! NOTE: I used a dark brown, “Dark Umber.” It is not as harsh as black, but still adds the “punch” that my piece needed.